New communication technologies disrupt conventional understandings of social behavior and relationships. This talk will show how social media have been used over the last two decades in ways that challenge, reinvent and reinforce audience communities, personal relationships, and the creative industries. The work discussed will include ethnographic analyses of fan communities online from Usenet to blogs, surveys and interviews with college students and social networking site users, and interviews with musicians and record labels. Nancy Baym is a Professor of Communication Studies at the University of Kansas. She is the author of Personal Connections in the Digital Age (Polity Press, 2010), Internet Inquiry (Sage Publications, 2009) and Tune In, Log On: Soaps Fandom and Online Community (Sage Publications, 2000) as well as many other publications. 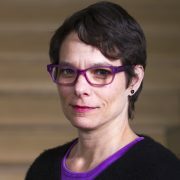 She serves on the editorial boards of many journals in the fields of communication and new media and co-founded the Association of Internet Researchers in the late 1990s. She has also been a Visiting Researcher at Microsoft Research New England. Nancy Baym is an Associate Professor of Communication Studies at the University of Kansas. Her research focuses on the roles of communication technologies in personal relationships and the changing relational dynamics of entertainment industries given the direct communication amongst fans and between artists and audiences that the internet enables. Her new book “Personal Connections in the Digital Age” has just been released by Polity Press. She was a co-founder of the Association of Internet Researchers and served as its President. She’s also a Consulting Researcher with the Convergence Culture Consortium at MIT.